Although the roads seem to be free from ice (fingers crossed as I write this) the water lying in the fields has a film of ice on it. Where the water is only a fraction of an inch or so thick – a few millimetres for those whose entire life has to be divided by ten – it is usually quite solid. The interesting thing about ice, of course, is that it is lighter than water, hence the ice cubes floating at the top of the glass rather than sinking to the bottom as, no doubt, they would if they had any sense of style. Just in case you live on that desert island we mention from time to time, ice floats because the same weight of water is larger when it’s a lump of ice – so the same volume of ice is lighter than the same volume of water – so it floats. The really interesting thing is, if it didn’t float, ponds and seas and stuff would freeze from the bottom up, making it impossible for life to survive in the oceans when, from time to time, ice ages wipe out everything that ventured out of them. It would also make it very hard for Eskimos to chop fishing holes through it. ‘A bad apple’ is a phrase that is easy to understand. But perhaps not. These days when apples, along with most fruit and vegetables come from the supermarket and people who lay them out in the loft, each individually wrapped in newspaper that the newsprint stayed on, are gone into the dustbin of history, along with the expectation that every boy over ten would have a penknife in his pocket. Not, for one minute, that I’m suggesting that this particular apple was bad – far from it it would seem. It certainly looks as though is has received a vote of confidence from the local wildlife. I didn’t want to touch it, it seemed as if it was hanging on by its fingernails, to look more closely at the tooth and beak marks inside the fruit. I’m inclined to think that the vote of confidence comes from The Blackbird – he is well known for his love of windfalls. Was this one just so scrumptious that he couldn’t wait for it to drop? It is just too easily accessible, sitting there, just a few feet off the ground, you don’t need wings to reach it, it could be almost anyone really. Today’s walk took us round to the sunny side of the hill. Well, over the hill and down the sunny side really. The first important thing, of course, is that it was sunny, so there was a sunny side. It wasn’t by any means warm, but the sunlight gave everything a cheerful glow. We didn’t meet anyone today so there was no stopping to chat – but The Dog did find an exceptionally fragrant pile of horse droppings and had to be forcibly removed from the vicinity. As we came down the hill we chanced to look across at the fields. A large boggy area round the base of the hill rising to a sandy summit covered in gorse bushes in a smooth vibrant green sweep. The gorse, at this time of the year, while it doesn’t lose all its leaves, does have a distinctly grey cast to it, as the leaves have become quite thin and the thorns have become dark dry spines. Well, surprise, surprise. There in the middle of the clump, at least one of the bushes had put forth a sprinkle of flowers! 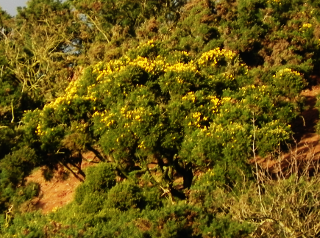 For Dr. Edward Bach (who died seventy six years ago yesterday – 27/11/1936) Gorse was about the return of hope to the hopeless – and very uplifting it was to find those bright yellow flowers twinkling at us in the sunshine. As there are no leaves left on the trees, it seemed appropriate to have a picture of a tree with no leaves on. It does seem strange doesn’t it? Here we are in the coldest part of the year and all the trees take all their clothes off and stand around naked like a bunch of sixties hippies at a music festival. It makes you wonder about the evergreen trees, the Pine, Fir, Holly and the Yew for instance, are they considered just a bit prudish by the other trees do you think? 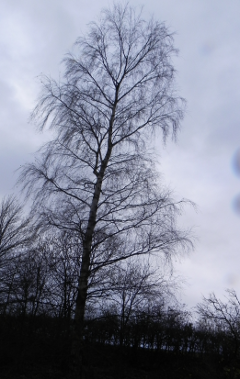 This is a Birch tree. Coleridge, in ‘The Picture Or The Lover’s Resolution’, a long involved litany of trees and plants, the sort of thing you might use to entertain an Ancient Mariner while he waited for a wedding guest to turn up, called the Silver Birch The Lady of the Woods. In America they do things differently and Hiawatha used a different member of the Birch family to build his canoe I’m pleased to report. This worried me throughout my childhood as, I had never seen a birch tree with sufficient girth to have made more than a pair of moccasins. Longfellow has our hero barking the tree using wedges to remove the bark but it seems that the bark, because of the oils in it, it doesn’t rot away as quickly as the wood inside it does, so it is often easier to find a dead tree and knock the rotten wood out of the middle of it. Back to the Silver Birch. It’s good for making brooms and besoms and in the spring you can collect sap from it and make birch wine. So, there you go, if you are feeling inclined to stand around naked it’s better to wait till spring – at least you can have a glass of wine to get you in the mood. The beck has risen to the point where, what was a hook shaped promontory, first became an island, it does this now and again – so that’s not too big a deal, and has now become a waterlogged swamp with just small areas of vegetation showing above the surface of the stream. A bit like Manhattan, I suppose. We keep and eye on the ‘island in the stream‘ because it gives us some measure of how much water there is in the beck. 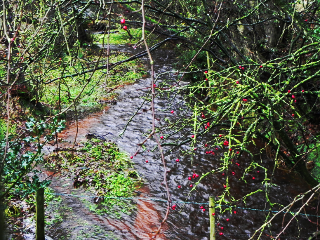 I don’t think our beck has any tributaries, I think it just collects water that runs off the fields – or perhaps, oozes out of the fields would be a more apt description. Trying to walk across them at the moment is like walking over a large, fully loaded sponge. It is still raining and it is going to rain again tomorrow. I don’t normally give weather forecasts too much credence but it’s hard not to believe it at the moment. 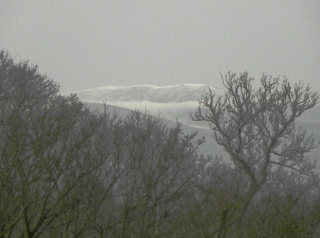 The sky is low and the horizon is close and soggy. When the much-married Ernest Hemingway died, his last wife put together ‘The Sea Book’ that he had often talked of writing, from stuff she found in the three hundred odd bits of finished and partly finished work he left behind. She then published it as ‘Islands In The Stream‘ and it did rather well for him. Our island isn’t very ‘Caribbean’ at the moment. When we woke this morning, after two days of almost continuous rain, driven by a mean and vicious wind, we woke to a gorgeous blue sky and a gentle breeze. There was just enough bite in the breeze to remind us that this fantastic sun filled day was only a few weeks away from the winter solstice, or the last day of autumn, or first day of winter, or the end of the world. So you may, or may not, want to move to red alert once the solstice comes round and we find ourselves with only three days left until Christmas. Of course, if you wanted to be rather safe than sorry, you could advance your Christmas celebrations to say, the twentieth of December. This means you have four days less before you need to have all present buying under control and I’m not sure if even the end of the world is worth that. 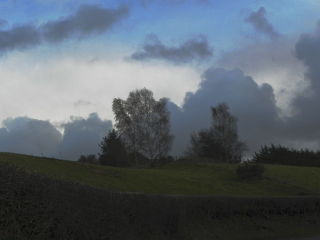 By the time The Dog and I set out to make sure that all was in readiness for the end of the world, or the solstice, the world had turned and our bit of blue sky had been passed on to some more deserving area while we were being threatened with this one, full of large black clouds. Well, I’ve looked under the tablecloth, and behind the furniture, and opened all the little doors on every page – but I still can’t find my sky.